The Cub control unit is the most economical unit we offer. It is perfect to use for signing your projects, adding decorative details to turnings and beginning pyrography. 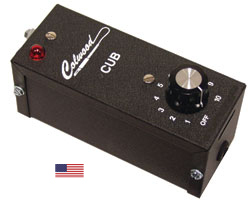 The Cub has a variable heat control for predictable results in a variety of materials. The on/off switch is built into the control knob with a pilot light to show when the unit is on. The ultra-flex pen cord (18 gauge) is built into the unit. Pen and tips for the Cub Woodburner are sold separately.